Features: What does the future hold for Hook? November 7 will be a big day not only for the current All Blacks, as they face Wales at the Millennium Stadium, but for the oldest of their predecessors. A few hours before kick-off, when it turns November 8 in Wellington, All Black number 417 Eric Tindill will reach the age of 98 years and 325 days. In so doing he will overtake Francis MacKinnon's record as the oldest Test cricketer of all time. No, you are not on the wrong website. The word really is 'cricketer'. If there is one thing more impressive than Tindill's longevity, it is the range of sporting uses to which he has put that lifespan. To be the only man to have played both cricket and rugby at Test level for New Zealand would be distinction enough. Tindill, though, did not stop at that. After his playing days he went on to referee international rugby and umpire a cricket Test - a 'double double' without parallel. That versatility was also in evidence as a player. He alternated between half-back and first five-eighth during a decade of first-class rugby. While a native of Nelson in the South Island, Tindill moved to Wellington in his youth and his career is associated with the New Zealand capital. It was an unhelpful location for his rugby ambitions during the 1930s as Wellington could call on copious midfield talent. He was, though, a beneficiary of the extraordinary thoroughness with which All Black selectors were wont to sweep the nation's playing stocks in search of talent in advance of major tours. Tindill's account of the 1935-6 All Black tour, written in partnership with team-mate Charlie Oliver, records that 188 players took part in the trials. Unsurprisingly talent often got lost amid the competitive maelstrom, but some previously unconsidered players rose to prominence. One of a handful of players to appear as often as four times in the trials, Tindill played himself into Jack Manchester's squad for the tour. For most of the trip he found himself playing second fiddle to the better-established Otago first-five Jack Griffiths, who appeared in the Tests against Ireland, Scotland and Wales. Tindill's cause may not have been helped by playing in the defeat by Swansea, the first All Black loss to a club side. He did, though, show a talent for landing drop goals - a handy skill in an era when they still counted four points, to three for a try - and two on Boxing Day against London Counties at Twickenham may have sealed his selection for the England Test on the same ground nine days later. This, of course, is the match remembered for the performance of another debutant - England's Russian prince Alexander Obolensky - who scored two extraordinary tries in a comprehensive 13-0 hammering of the touring team. Tindill's first Test also proved to be his last. Griffiths was elevated to the All Black captaincy against Australia in 1936, then Tindill was ruled out of contention for the 1937 series against South Africa by winning selection as wicket-keeper for the cricket tour of England. The cricket team could probably have put out a decent rugby XV as well. Skipper Curly Page had played for the All Blacks against New South Wales in 1928, a match nowadays recognised as a Test by Australia, though not New Zealand. Bill Carson would become an All Black, although never playing a Test, a year later and Martin Donnelly was to play outside-half for England after the war. It was a time when two-sport stars were common in New Zealand - his All Black co-author Charlie Oliver had gone on the 1931 cricket tour of England, but had not played a Test. Wisden reported that Tindill "did nothing out of the common with the bat, but as a wicket-keeper he was always worth his place", a valuation supported by his playing all three Tests but scoring only 58 runs. He was recalled by the All Blacks as a half-back for the 1938 tour of Australia, playing in three state games. Winston McCarthy, New Zealand's pre-eminent commentator of the post-war era, had little doubt that but for the war he would also have gone on the 1940 tour of South Africa as deputy to the brilliant Charlie Saxton. The war inevitably curtailed his rugby career, but he continued to play cricket for Wellington until 1950 and appeared in New Zealand's first two post-war tests, including the historic debacle in which Australia bowled them out for 42 and 54. Batting at number five, his scores of 1 and 13 made him one of New Zealand's more successful batsmen. By then he had turned to refereeing, displaying an unobtrusive instinct for where the game was likely to go so acute that McCarthy recalled, "In one match in which six tries were scored I saw the six of them scored at Eric's feet as he waited for the player to ground the ball." He refereed the first two tests of the 1950 All Blacks v British & Irish Lions series and the tourists would happily have had him again but, McCarthy recorded, "it was felt diplomatic to share the others out." He took charge of a further Test in 1955, then in 1959 returned to Lancaster Park, venue for this second Test as a referee, to umpire the cricket Test against England. 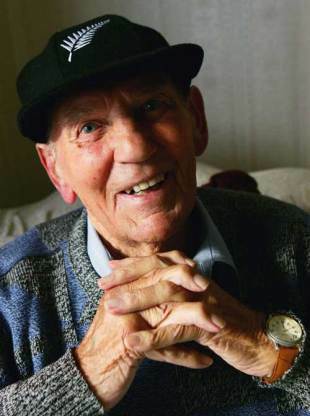 He is by more than six years the oldest living All Black - prop Morrie McHugh,92, is the only other over 90 - and the last survivor from before the war. He will, though, have to live a little longer if he is to follow the habit of a lifetime and add the longest-lived Test rugby player title to the cricket one he acquires on November 7/8. There the record lies with Scotland's Mac Henderson, who was 101 years and 309 days when he died earlier this year.